The Undergraduate Research Opportunity Program, a.k.a. 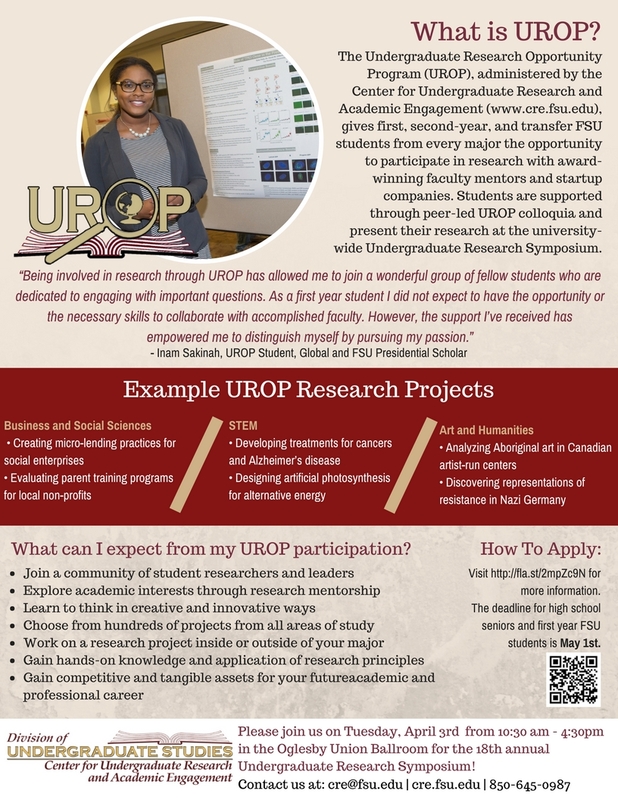 UROP, is a program for students in all majors to connect with research mentors. Only current first year FSU students, incoming high school, or transfer students are eligible for this opportunity. The deadline to apply is coming up quick: May 1st, 2018 for high school students and first year FSU students, and July 1st for transfer students (who transferred in spring 2018 or are transferring in summer or fall 2018). or call Alicia Batailles, the Assistant Director for the FSU Center for Undergraduate Research & Academic Engagement at 850-645-0987.